So let me begin by saying this: I know that there are millions of Americans who are content with their health care coverage … they like their plan and they value their relationship with their doctor. And that means that no matter how we reform health care, we will keep this promise: If you like your doctor, you will be able to keep your doctor. Period. If you like your health care plan, you will be able to keep your health care plan.Period. No one will take it away. No matter what. My view is that health care reform should be guided by a simple principle: fix what’s broken and build on what works. The President overpromised. So far the best he can deliver is, “If you like your health care plan, you will be able to keep your health care plan, as long as you’re not one of the 10 million people whose employer will decide to stop offering you health insurance through your job.” I think that loses some of its rhetorical punch. Let’s look at what the Congressional Budget Office says would happen under the draft Kennedy-Dodd health care bill. Here’s the diagram I showed you yesterday. The relevant arrow is in red. That 14 m number was a net figure. It was close, but not entirely correct. CBO Director Doug Elmendorf has posted a helpful follow-up on his blog which “unpacks” that red arrow into its component parts. Kudos to him for doing so. I am going to expand part of the above diagram using Dr. Elmendorf’s new information. These new lines below replace and correct the “14 M” red arrow and the “16 M” blue arrow from yesterday’s diagram above. I also have to shift from 2015, which I used yesterday, to 2017, which Dr. Elmendorf uses in his post. The two-year difference is trivial and does not change the underlying substantive point. 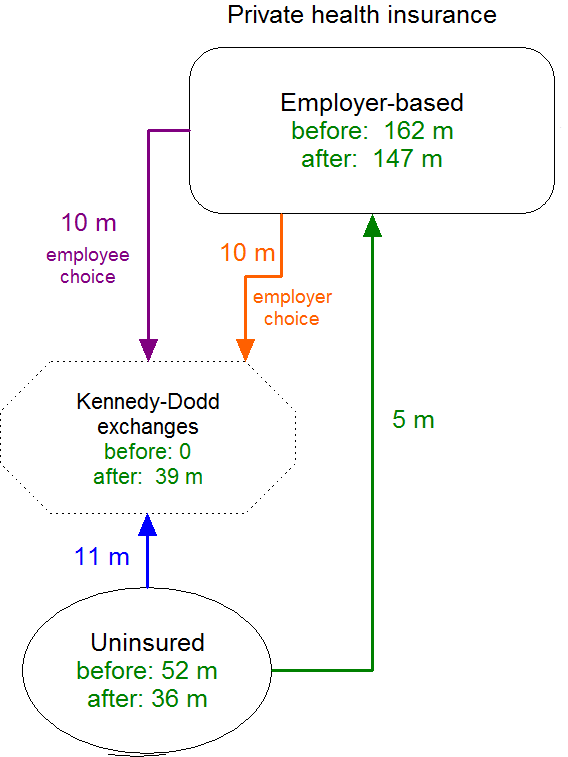 Director Elmendorf explains that, under the Kennedy-Dodd draft, 20 million people would leave employer-based insurance and instead use the new subsidies to buy insurance through an exchange. Some individuals would have insurance coverage available from their employer, but would also have an option to obtain subsidized insurance from an exchange. That opportunity would exist for people whose incomes were sufficiently low – and the cost of employer-sponsored insurance sufficiently high – so that the insurance would be categorized as “unaffordable” under rules that would be set by the Secretary of Health and Human Services. … By CBO’s estimate, about 10 million people with this choice would opt to obtain insurance from exchanges rather than from their employer. The availability of subsidized coverage in the new insurance exchanges would be an attractive option for many lower-income workers. As a result, some employers would decide not to offer their employees health insurance coverage, opting instead to provide other forms of compensation. CBO estimates that about 10 million individuals who would be covered through an employer�s plan under current law would not have access to that coverage under the draft legislation because some employers would choose not to offer it. The net effect of the blue and green arrows is still a decline in the number of uninsured by 16 m, but now it’s split into two parts. And the net decline in employer-based coverage is still the 14 million from yesterday, but that’s the result of (10 purple + 10 orange – 5 green = 15 red), where the 15 vs. 14 is from shifting from 2015 to 2017. 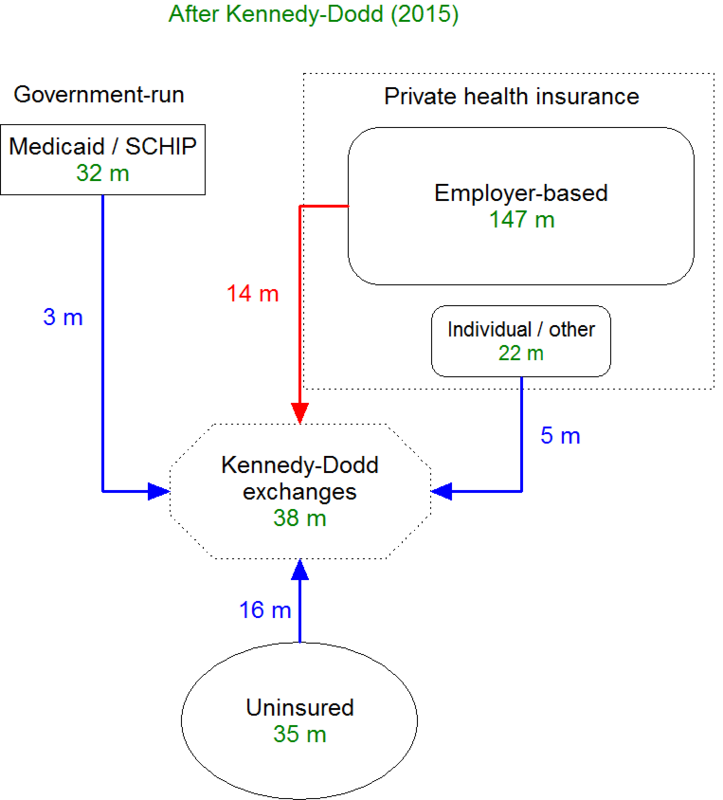 While I am flagging it as substantively significant, it may surprise you that I am not going to criticize the Kennedy-Dodd bill for the harm done to these 10 million people who would lose their employer-based coverage through “employer choice.” This is a painful but unavoidable consequence of (partially) leveling the financial playing field between employer-based and individually purchased health insurance. I strongly oppose the Kennedy-Dodd draft for reasons that I have previously described. But leveling this playing field is a good thing. Rather than creating a new spending program, I would completely level the playing field by eliminating the tax exclusion and creating a new tax preference for health insurance that was independent of how you bought it. When President Bush proposed such a policy in 2007, we faced the same effect that I describe here for Kennedy-Dodd. Some people are hurt because they would lose something they value and now have. If you design your plan right, far more people are better off, and you have to decide whether the tradeoff is worth it. So while I am tempted to attack Kennedy-Dodd for this reason, my desired reform suffers the same downside. It is an unfortunate but unavoidable consequence of moving away from a system so heavily biased toward employer-based insurance. There are plenty of other reasons for me to oppose Kennedy-Dodd. If you like your health care plan, you will be able to keep your health care plan. Period. No one will take it away. No matter what. Under the Kennedy-Dodd bill, that is not true for 10 million people. And the same will be true for any other bill that levels the playing field between employer-based and individually-purchased health insurance, which means any bill that offers subsidies to buy insurance outside of your job. You cannot avoid this problem. The mistake is not the unavoidable policy consequence. The mistake was making a Presidential promise that cannot be kept. The Administration and its Congressional allies can mitigate but not eliminate the 10 million number. They can reinstate the employer mandate that Kennedy left out of the draft he gave to CBO, and I assume they will do so. By raising the costs on employers of dropping coverage, the 10 million number will go down. But to get that 10 million down a lot, they would have to make the financial penalty on employers for dropping coverage exceedingly high, and they would have to be explicit in their legislative language for a skeptical CBO to give them credit for it. The higher that penalty, the fiercer the opposition from employers. And no matter how high they raise that employer penalty, I expect CBO still would not take the 10 million figure down to zero. The Administration and its allies have boxed themselves into a corner. The President made and repeated a sweeping promise, that no one would lose the health insurance and doctor they have now. This is smart politics and good legislative strategy as long as it doesn’t backfire. CBO is now on record that the Kennedy-Dodd draft does not fulfill the President’s promise. That’s an immediate problem for Kennedy and Dodd, and a near-term problem for the Administration, which now has to figure out whether they support an excruciating employer mandate to get the 10 million number down, and how they’re going to mitigate this problem for other bills that will have the same ugly feature. Even if they do, I expect that any solution will still violate the pledge for millions of people, although fewer than 10 million. Had the President not made this statement, the Administration would have a policy problem with an obvious solution: get the number down through the employer mandate, and argue that those who are hurt are far outnumbered by those who are helped. Instead, they now have this policy problem, combined with a “Presidential promise” problem. The President’s advisors never should have let him make this promise that he cannot keep.